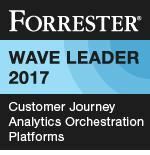 14th September – London – Thunderhead, the pioneer in enterprise technology for customer engagement, have today been named as a Leader in The Forrester Wave™: Customer Journey Analytics Visioning Platforms, Q3 2017, and The Forrester Wave™: Customer Journey Analytics Orchestration Platforms, Q3 2017. The Wave™ research acknowledges the practice of journey analytics as an emerging market and reviews 10 and 13 vendors (in the Visioning and Orchestration reports respectively), in respect of their current offering, strategy and market presence. Forrester notes that, Thunderhead is amongst vendors that “lead the pack”. Forrester’s view of journey analytics is based on four core capabilities: data fusion, journey design and planning, journey testing and optimization, and journey automation and orchestration. Forrester reports that vendors stand out because of their ability to integrate seamlessly, deliver insights at speed, measure business impact, orchestrate next best actions across a variety of systems, and be pragmatic and adopt a co-creative stance. Both reports note that that “integration, speed to insights, and real-time decisioning are key differentiators.” In the reports, ONE received among the highest scores in the strategy category. In the Visioning Platforms Wave™, Thunderhead receives the highest score among all vendors in the data fusion criterion. ONE is further recognized for speed of deployment in both reports.